The initial steps in 1970 when creating the project were to re-engineer the frame and the lower a-arms. The Spitfire's upper and lower a-arms were modified to accept Chevy ball joints. The lower a-arm was strengthened by boxing in the channel shaped parts and adding an eighth inch thick plate on the bottom. To hold the lower ball joint, the tip of a stock Nova stamped metal lower a-arm was added. The background image of this page shows the cleaned left lower a-arm. Note the plate on the bottom and the modification for the lower ball joint. The hole in the plate is for the anti-roll bar link. For the inspection and upgrade project, the lower a-arms were bead blasted and subject to magna-fluxing to check for cracks and metal fatigue. To protect them from rust and to look asthetically nice, they were powder coated black. 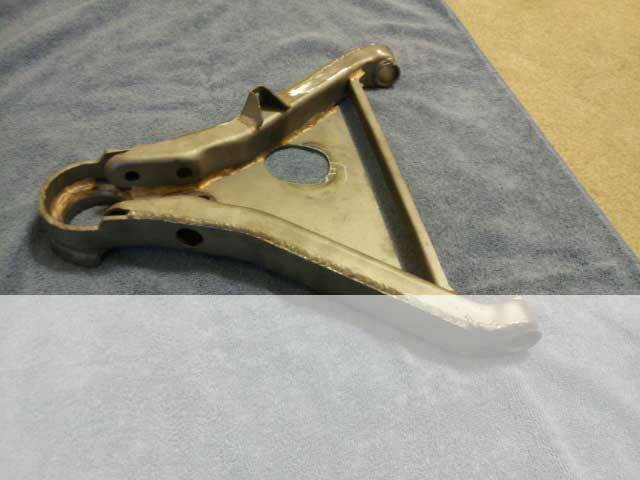 The following images show the plate-side of a lower a-arm and after powder coating. The finished a-arm is attached to new frame brackets and has the new lower ball joint pressed in. Note the small rectangular hole in the plate: This is for relief for the new billet aluminum shocks. The a-arms are ready for installation.